Fjord continues to present more project for its Open series, and after a year of showing a new flagship 56 model, the company now presents a 48. 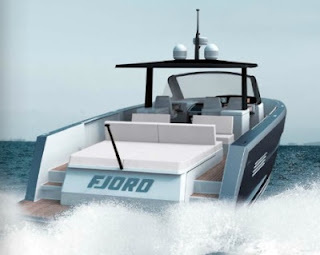 This new 48 Open will be an intermediate between the 40 and the 56, and as all current Fjord's is also a design of Patrick Banfield Allseas and is a full deck space use sport cruiser, with a nice inteiror layout with two cabins. The 48 Opens offers three different deck layouts with one of these offering also a tender garage under the sunpad. The interior will offer two cabins both with en-suite shower heads. The main owners cabin is located to fore and will also feature a small lounge l-shaped to port side. Power is from triple Volvo 435hp engines with IPS pods drives which should give top speeds up to 41 knots.